“St. John’s e-Vangelist” for May 30: Trinity Sunday — Graduate Information — Help Our School Win $10,000! 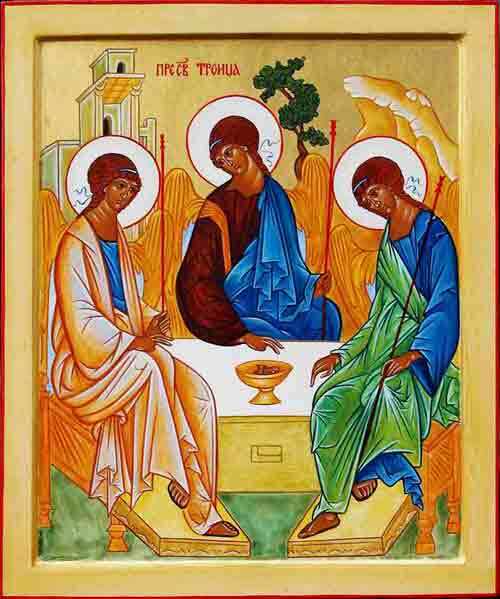 We worship as usual this weekend: Our convenient community Holy Eucharist service today (Saturday, May 30) at 5 p.m. and on Trinity Sunday morning at 8 and 10. Mo. Martha said the other day that it’s the only Sunday in the Christian calendar expressly dedicated to a doctrine: The orthodox teaching about the consubstantial Father, Son, and Holy Spirit, Creator, Redeemer, and Sustainer, perfectly distinct and yet one substance, different and yet exactly the same. Put another way, it’s a relationship that works, as depicted in this popular 15th century Russian icon by Andrei Rublev. Please give the whole question some thought. We’ll talk more in church! While you’re at your computing device, please go to the link below and enter St. John’s Episcopal School in Rancho Santa Margarita to help us try to win $10,000 in support of the “science” in our new STEAM program. Entries must be in by this Sunday, May 31. If you don’t want to get those pesky if well-meaning e-mails from the sponsors, be sure to check the right box. On behalf of our students and faculty, thanks for your help. Speaking of teaching, you can give our hardworking Sunday School faculty a richly deserved break by serving as a Summer Funday School teacher any Sunday between July 5 and Sept. 6. For your choice of preschool through first grade or second through fifth grades, we’ll provide a teaching plan that you can adjust to your personal style. If you want to help, please contact Lorraine Kamholz at lkamholz@cox.net or Sheryll Grogan at sgrogan@stjohns-es.org or look for either of them on Sunday. And speaking of graduating (or being graduated, as grammarians once insisted), we need your graduate’s .jpg and joyous details by Wednesday, June 10 for our annual color supplement. Please send them to Sandy Flick at assistant@stjohns-es.org.